Fairway Oaks is a North Myrtle Beach resort that is so different from most of the resorts in the North Myrtle Beach area. This charming neighborhood is comprised of an enclave of buildings that each has two townhomes. With a residential feeling that is quaint and peaceful, Fairway Oaks is a wonderful alternative to your typical vacation accommodations. This community features a sparkling blue swimming pool and hot tub around which tables and chairs are situated. Fairway Oaks is so called because it is nestled alongside a North Myrtle Beach golf course. Fairway Oaks is in the Cherry Grove section of North Myrtle Beach, South Carolina. It is on 20th Avenue North and about five blocks from the white sandy beaches. You can walk to the Atlantic Ocean from your townhome in Fairway Oaks. After spending a couple hours of the beachfront collecting seashells and building sand castles, you can mosey back to your quiet North Myrtle Beach resort for a dip in the sparkling blue swimming pool. Then retreat to your comfortable North Myrtle Beach vacation rental. From the beautiful entrance of this North Myrtle Beach resort to the children’s playground that is located on site, Fairway Oaks is a pleasant choice for your North Myrtle Beach vacation. Ponds with fountains are part of the landscape and the sound of that tranquil feature is quite relaxing. 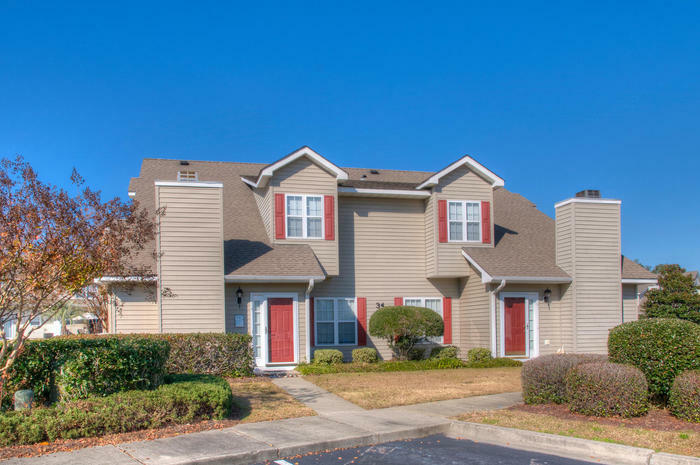 All of the North Myrtle Beach condominiums at Fairway Oaks have three bedrooms and two full baths. These condos in North Myrtle Beach, SC are laid out and furnished so as to sleep eight, 10 or 12 people in utter comfort. Each of the townhomes at Fairway Oaks is two stories. The ground level of these North Myrtle Beach rentals features a great room with a living room, dining area and kitchen. The living room opens to the patio, which in most units is furnished, and it is through these glass doors that sunlight shines into your beautiful North Myrtle Beach condominium. The kitchen in each Fairway Oaks is well equipped. Full-size appliances are convenient features and this includes a dishwasher. The North Myrtle Beach rentals at Fairway Oaks have a washing machine and clothes dryer and many of these North Myrtle Beach condominiums also have high-speed Internet access. You will find televisions and usually at least one DVD player in these townhomes so as you can see they live as comfortably as your own home does. Plus, most of these North Myrtle Beach condominiums have a fireplace, which is really nice if you are spending your North Myrtle Beach vacation at Fairway Oaks in the winter months.